Since the early 1930th a number of special vehicles for different tasks were developed and built. Among these a few were used by IJA engineers. These included chargelayers, obstacle removing and mineclearing tanks. The remote controlled vehicles are subject of a later post. Therefore a versatile and mobile vehicle with several modules for the different tasks was developed. 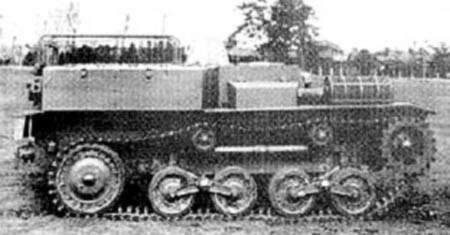 The suspension was similar to the Type 89 Medium Tank with two sets of two pairs of small, bogie connected roadwheels sprung by large packs of leaf springs each. A large driving wheel was at the bow, a large idle wheel in the rear. Four return rollers completed the suspension. The armor was between 6 and 25 mm thick. The frontal armor had a sloped center part, a vertical lower part and an almost vertical upper part. On the left side of the upper armor a large mount for a Type 93 Flamethrower was added. The driver´s visor hatch on the right was openable to the top. The side armor was vertical with the upper part arranged sloped. Diagonal armor plates connected the sides with the bow and rear armor. The rear armor was vertical. A hemispherical commander’s cupola was mounted centered on the forward top armor. 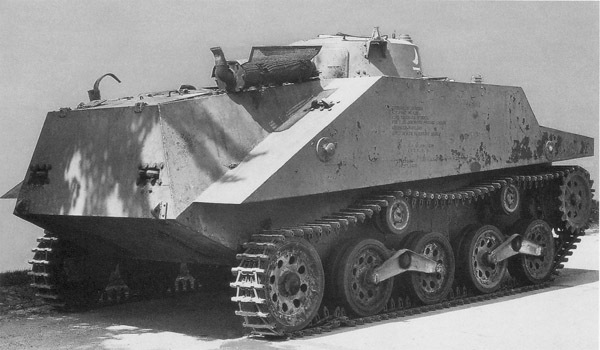 The suspension was covered by 6 mm trapezoid armor plates . A large, two-part access hatch in the top armor allowed engine change. The rear engine compartment was accessible from the forward fighting compartment, too. A 105 hp gasoline engine was used which should be replaced by a Diesel engine as soon as possible. There were several attachment points on the bow, top and rear. On the bow mine forks plus an obstacle clearing wedge or a 300 kg explosive charge could be added. On the top a crane, smoke agent canisters and/or two different types of bridges (7 m and 10 m scissor type) could be carried. On the rear a fluid tank for chemical agents or flame oil or a large trench plough could be attached. The chemical agents could be dispersed by a spray nozzle attachable inside the flame thrower mount. The vehicle was able to fulfill all demanded tasks but not at the same time as some modules couldn´t be used parallel. First operational tests started in 1933. 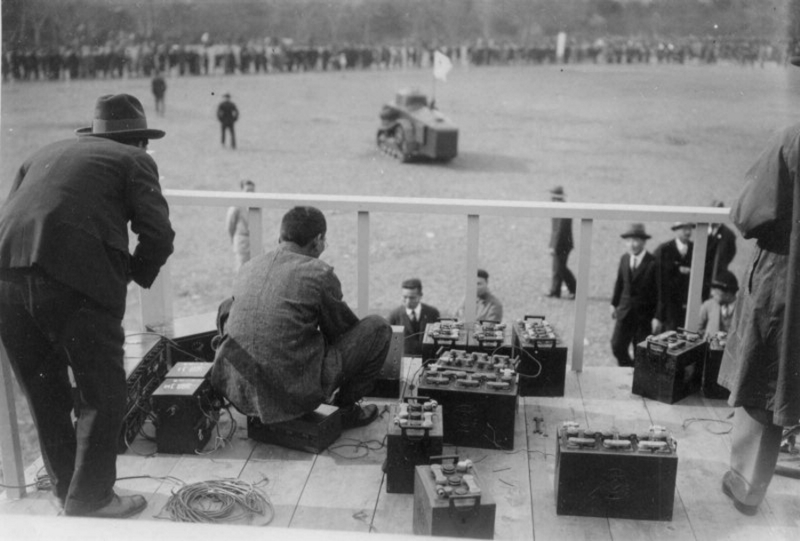 In 1934 two vehicles were send to China to be tested at 1st Mobile Brigade. Due to the available space inside the vehicle the new Type 94 Model 4 radio set was added in 1935. Several necessary changes and a low priority delayed official introduction until 1936. 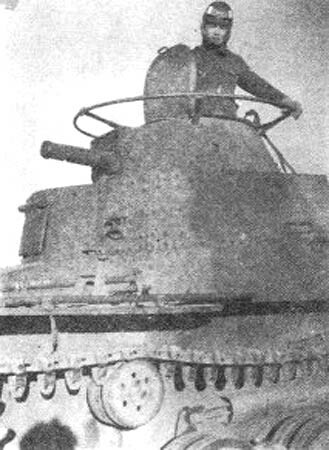 As this vehicle was developed for engineer units which were not allowed to operate “tanks” the designation “Soko Sagyosha” = “Armored Working Vehicle” was chosen, short designation “SS”. Basic production version with a 140 hp gasoline engine. 13 were built. Version Otsu had a modified suspension with one return roller removed, and modified Driving and idle wheels. The vehicle seemed to be specialised to flame throwing. Four small, armored flame oil tanks were mounted fixed between the suspension parts. 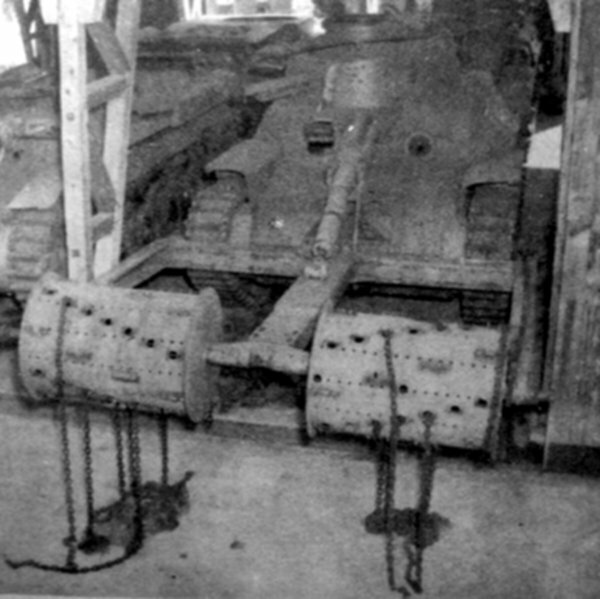 Due to the tanks the suspension armor could not be used any more. A concrete made flame oil tank was added to the rear. An additional flame thrower mount was implemented in the remodeled forward side armor. In addition the bow armor was remodeled similar to the Type 89 tank with a sloped lower part and a vertical upper part. Version D was a remodeled version B. Driving wheels and idle wheels were modified again to spare weight. The shape of the driver´s hatch and the bow flamethrower port were modified and a standard MG mount for a Type 97 7,7 mm MG was added between them for better close defense. The Type 93 flamethrowers were later replaced by the lighter Type 100 Flamethrowers. The commander´s cupola was now conical. And the Diesel engine was used. 20 vehicles were built. Modified version D. The suspension was simplified by removing another return roller and the armor plate wasn´t used any more but suspension side armor was increased to 13 mm. The commander´s cupola was now cylindrical. Armament consisted of three standard infantry Type 100 Flamethrowers and a Type 97 7,7 mm MG. 77 vehicles were built. The need to exchange the modules for different tasks finally leads to the decision to develop special purpose-built vehicles as replacement around 1940. None of these developments was introduced. They will be covered in a different post. Several Independent Engineer units and after 1942 especially the tank division engineers were equipped with the SS. Informations on this vehicle are also rare. 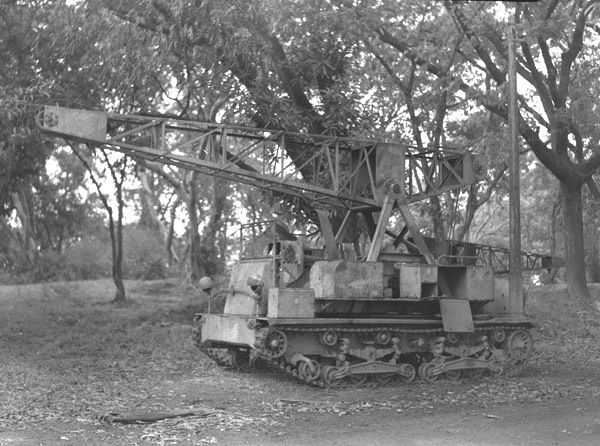 In 1935 the decision was made to develop a special crane vehicle for heavy engineer duties. The suspension was similar to the Type 97 Medium Tank Chi-Ni with four pairs of small roadwheels. The engine was placed left of the driver in the armored driver´s cabin. On the rear a medium size, 3t boom crane with a 4,5 m jib was mounted turnable. Crew consisted of driver, commander and crane operator. In late 1938 a special vehicle for the destruction of enemy wire based communication equipment was developed. 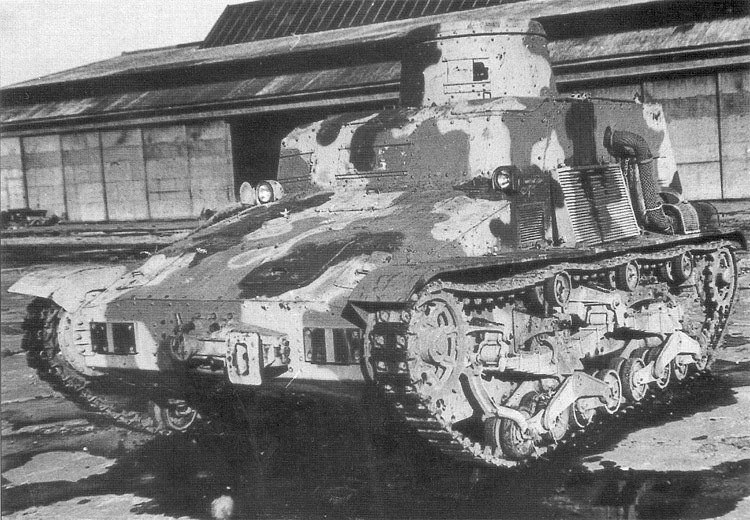 It was based on the Type 97 Medium Tank Chi-Ha. The superstructure was heightened to allow mounting a generator and a 10.000 V alternating current dynamo inside. The bow MG was removed and the driver sat in centerline. A small turret with a dummy gun and a hatch was added to keep the outer shape of a regular tank. The vehicle was driven to a telephone or telegraph cable and earthed. Then the current was sent into the cable destroying attached equipment and killing users in up to an unknown maximum distance. A total of 4 vehicles were built and used by the 27th Independent Engineer Regiment in China. In 1944 a special generator tank was developed and built, based on the Type 2 Light Tank Ke-To. Main purpose was to deliver power for larger electric machinery like pumps, saws and jackhammers. 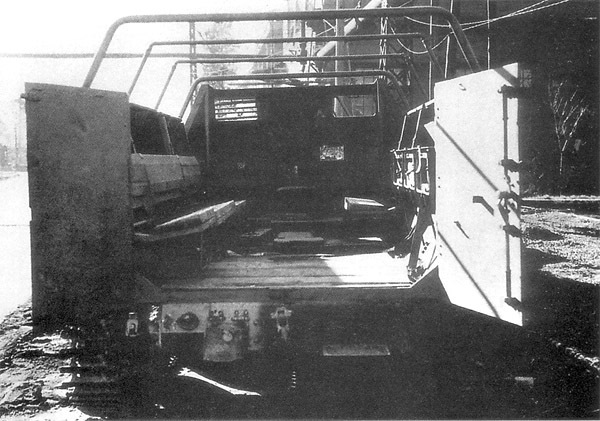 A large 30 kW generator driven by the vehicle´s engine was mounted inside the fighting compartment. A small cylindrical turret with an extension for a standard MG mount replaced the original turret. A medium sized spotlight was mounted on the rectangular turret hatch. A small crane was placed on the rear of the turret. Last edited by tom! ; 01-18-2018 at 12:36 PM. 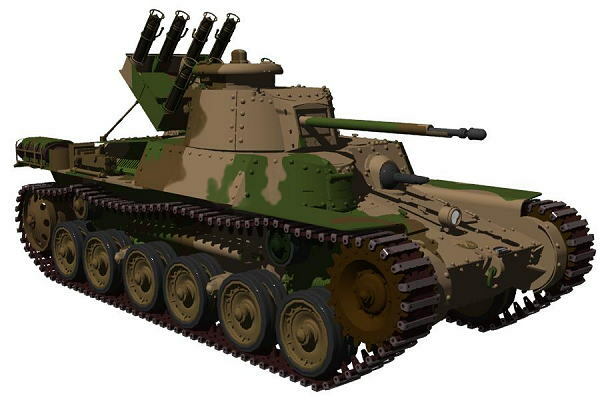 After taking over northeastern China in the late 1920th IJA developed and used several AFV for railway security and repair purposes. Most of these vehicles had more or less complex dual suspensions for road and railroad usage. As IJA High command didn’t wanted to have tanks outside tank units it was not allowed to mount a fixed armament and possible armor strength was limited. Additionally the designation was again just “vehicle” . There were also armored trains and handcars used by railway regiments and a single railway gun used by a railway artillery unit. a) Sumida Type RSW Railroad Vehicle. 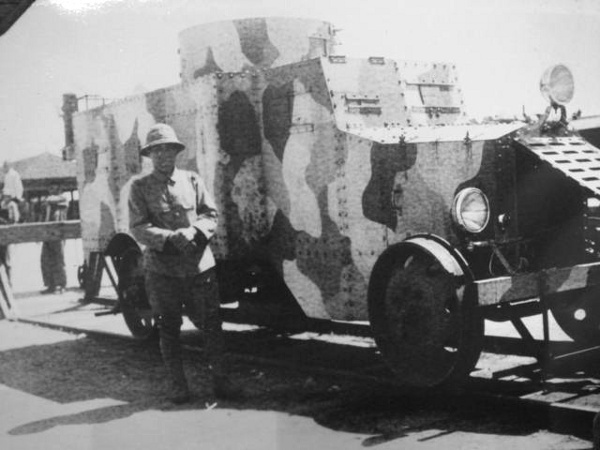 In the late 1920th IJA ordered Ishikawajima´s Sumida factory to develop a special armored car for railway use. Main purposes should be guard duty, transport, towing of small wagons and armored reconnaissance. The development started under the internal designation RSW using an own 4X2 truck chassis. The armor consisted of 6 mm face-hardened steel plates riveted to a frame. The armor was mainly arranged vertical with only the upper engine cowling and the driver cabin´s frontal armor arranged sloped. A large cylindrical rotating turret was mounted on the top. There was no fixed armament installed but it was possible to mount the standard light MGs issued to the railway regiments. The MGs could be mounted in several MG ports on each side of the vehicle and the turret. The suspension was powered by standard gasoline truck engine and transmission. Due to its limited power the heavy vehicle was underpowered and there was just one reverse gear limiting the reverse speed. Road usage was not possible limiting the operational possibilities. At least one vehicle was produced and tested 1929 in Manchuria. There was no serial production. The whole concept was rated useful even with its several design problems. After testing the RSW Railroad Vehicle the decision was made to use a larger 6X4 truck chassis as basis for such a vehicle. Sumida used its Type P Truck to develop a new railway vehicle with better performance. Internal factory designation was “Type PA”. 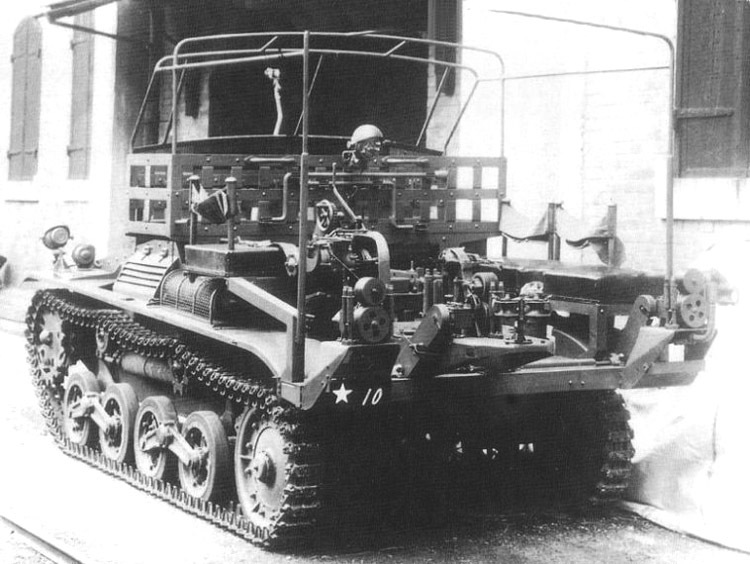 The prototype was similar to the parallel developed Type P Armored Car but it had no rubber rings on the steel wheels making road usage still impossible. The more powerful engine allowed a maximum speed of 40 km/h forward but due to the single reverse gear reverse speed was still low. A coupling on bow and rear allowed connecting railway cars to the vehicle. The vehicle was rated superior to the RSW and so the official introduction followed 1930 as “Type 90 Railroad Vehicle”. Production number is unknown. Updated version of the Type 90 Railway Vehicle. Main changes were an enlarged fighting compartment and special rubber tires for road usage. To change from railway to road and vice versa the vehicle was lifted by two large hydraulic jacks on bow and rear. Then the steel tires for railways were exchanged by the rubber tires for roads or reversely. The wheels could be mounted with spacers if necessary. With them it was possible to use the vehicle on standard gauge and broad gauge railroads. The transmission still had only 5 forward and one reverse gear making it slow driving backwards. So most of the time the vehicles were used in pairs connected with their rear couplings. That way there was always one driving forward. Again no fixed armament was mounted but it was possible to use standard infantry MGs through several ports around the armored body. Armor strength was only 6 mm making it hard even to defeat infantry ball ammunition on shorter ranges. Total weight with a 6-cylinder gasoline engine was 7700 kg. Production started 1932 at Ishikawajima´s Sumida factory. A total of around 1000 vehicles were built. They were issued to Railway Regiments bound for continental services and garrison units of the South Manchurian Railway Company. Main usages were armed transport, guard duties and railway repairs. 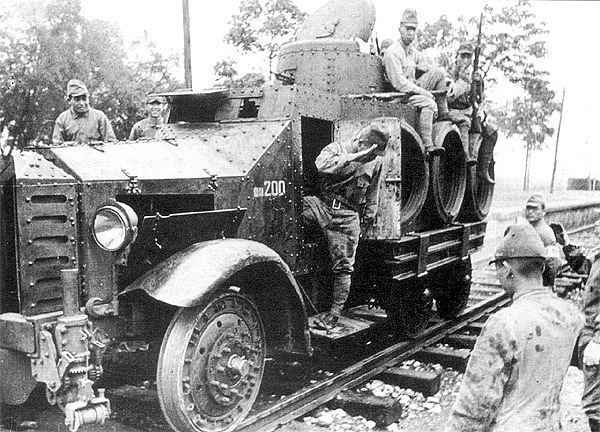 During the 2nd Sino-Japanese War some vehicles were also used for armed reconnaissance on railways. In 1934 a special vehicle for railway engineers was ordered for the South Manchurian Railway Company. It should be able to use narrow, standard and broad gauge railroads. To increase cross-country abilities a tracked suspension should be used off the railroads. The change between the suspensions should be done easily and quick. For better crew protection the armor should be up to 8 mm thick. Tokyo Gas and Electric (TGE) was ordered to develop the vehicle. 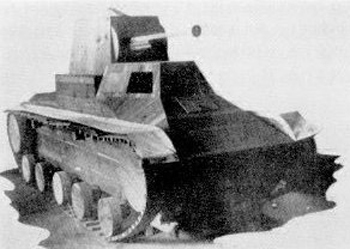 The resulting proposal was a tankettes-style vehicle similar to the Type 94 tk Special Tractor but larger. The tracked suspension was a TGE development from the early 1930th. It was similar to the Armored Working Vehicle SS and consisted of two sets of two pairs of roadwheels. Each pair was connected by a bogie and each two pairs were connected to a large leaf spring package. Forward driving wheels and rear idle wheels were used as well as three return rollers. The railroad suspension consisted of four steel wheels on two axles mounted inside the vehicle. Steel plates covered the moving parts. The gauge could be easily adjusted by pushing the wheels along the axles to special fixing points. Then the whole construction was lowered to the tracks through holes in the lower armor by a hydraulic system able to lift the whole vehicle. Changing to railroad suspension took 3 minutes, to ground suspension 1 minute. The armor scheme was similar to the Type 94 tk but without the armor extension on the bow and the driver´s visor port integrated in the upper superstructure armor. A small slightly conical turret with a gun port in the front side was mounted centered on the fighting compartment. There was no fixed armament but a standard infantry MG could be mounted. Main purpose of the vehicle was armored transport of men and material to damaged tracks. Two couplings on the front and the rear allowed towing of light wagons or the Type 91 Railway Vehicle. A total of 121 So-Ki were produced by TGE and Mitsubishi. One vehicle remained at the Kubinka Museum near Moscow and another one in a museum in Beijing. This vehicle is not well known and informations are rare. 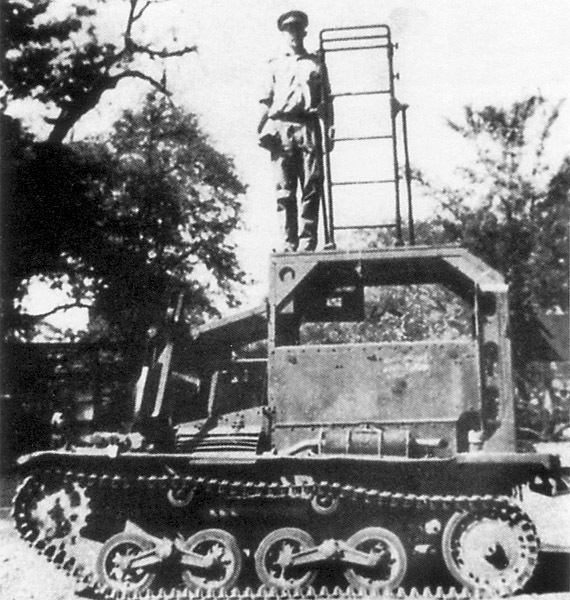 After developing the Type 95 So-Ki TGE was ordered to develop a special lightly armored crane vehicle using the same railroad suspension. This time the suspension of the type 89 Medium Tank was used for ground travelling. A lightly armored superstructure was added with a semi-open driver´s cabin in front and the engine in the rear. On the center of the vehicle a 5 t boom crane for railway repairs and recovering of trains was mounted. Production data are unknown. After the tests and trials with the Nagayama Tank were finished in the early 1930th the decision was made to continue development using a Type 94 Special Tractor in 1935. The conversion of the prototype was done fast and first tests were successful. So the decision was made to convert at least a second vehicle for operational tests. Further data are unknown. In 1936 the vehicles were reconverted to the standard configuration. The concept of a radio-controlled vehicle was also abandoned in favor of remote-controlled vehicles using electrical commands transmitted by cables. In 1933 the concept was still rated good and a second development program was started on a wider base. But instead of a large tank a small electrically powered tracked vehicle should be developed. Works started in late 1933. The vehicle frame was made out of a light-weight but very stable Aluminium-Silicon alloy. Suspension consisted of two pairs of small roadwheels, a fifth raised forward roadwheel to increase cross-country maneuverability, a forward idle wheel, a rear driving sprocket and two return rollers. Tracks with 87 links were used. Two watertight 600 V electrical engines delivering 1 hp each were placed in the rear half inside the frame. Each engine powered one of the tracks. The control/power cable reached the vehicle from the rear. A barrel with a cone on its end was mounted on the vehicle as strain relief. On the bow was a metal box for the explosive charge. The cable had 13 wires, two for power supply and 11 for control commands. It was covered by a layer of rubber and hamp fabric. For an easier transport cable segments of 250 m length were used which could be connected. Maximum allowed length of a connected cable was 500 m on even ground. Cross-country only one cable segment should be used. The total height was just 460 mm, length 1425 mm. With a 35 kg charge the total weight was below 200 kg. On roads up to 18 km/h were reached, 4 km/h cross-country. Special version of the late production Type 94 Special Tractor for communication units. The bow armor was heightened but still had the armor extension above the gearbox. The driver sat behind a windshield in an open driver´s and engine compartment with the engine placed on the left. Two hinged armored caps were added for protection against rain or snow. The rear half of the vehicle was a large storage with components to unwind cable reels. The cable could be unwinded to the rear or redirected to the a small support sustainer on the right bow holding the cable up and so making cable attaching to poles easier. Storages were added for several cable reels. The whole storage could be covered with a canvas. The total production numbers are unknown but low. Another special version of the late production Type 94 Special Tractor for communication units. It had the same bow as the cable layer and a similar driver´s compartment. But it was covered by a fixed armor plate. The rear storage compartment was covered by a steel roof and had side armor. A collapsible ladder could be erected on the roof to reach the top of higher poles. On each side of the vehicle two pairs of mounts were welded to the driver´s compartment and the rear roof trestle to carry a total of six wooden poles. On the storage compartment a large earth drill was mounted. The vehicle drilled a hole in the ground, a pole was placed inside it and a cable was attached to the pole. Pole planter and cable layer should work as pairs. The total production number is unknown but low. 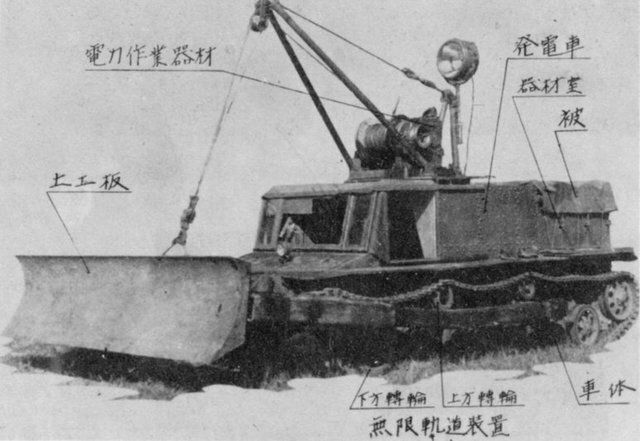 Special recovery vehicle based on the Type 97 Medium Tank Chi-Ha. The basic vehicle was identical. The turret was replaced by a smaller conical turret with a round hatch and a standard MG mount in the front. 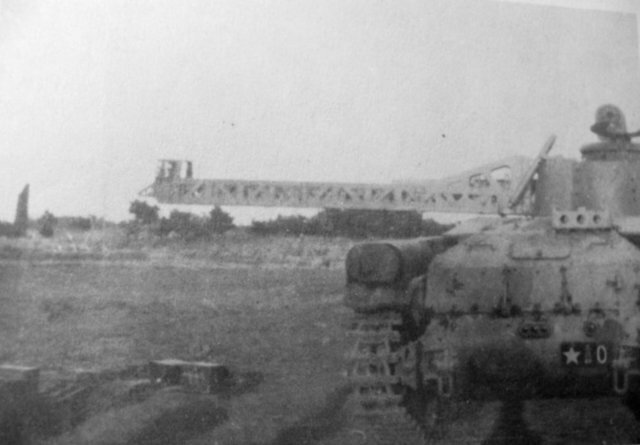 On the rear armor a 2,5 t crane was mounted to tow other vehicles . On the side armor and on the rear storages for additional equipment were placed. A total of 3 Se-Ri were built and used by vehicle test facilities. Special command tank based on the Type 97 Medium Tank Chi-Ha. The suspension was identical. The upper bow armor was flat instead of slightly curved. The bow MG was replaced by a Type 98 37 mm Tank Gun mount making a slightly higher superstructure necessary. The turret was replaced by one without a tank gun. Only the rear MG remained but in 180° position. Instead of a gun a small table and additional observation devices were mounted. The commander´s cupola was centered and shifted to the front of the turret . Production numbers are unknown but low. It is unknown if it was planned to equip each regimental command section with such a vehicle. Only Chiba Tank School used it for unit training. Special observation vehicle based on the Type 97 Tankette Te-Ke. The suspension was identical. The engine was shifted to the right front next to the driver. The fighting compartment was enlarged to the rear and the sides. The commander sat behind the driver under a rectangular conical cupola. On his right side a 0,75 m rangefinder could be mounted on the engine compartment. Crew consisted of up to 8 men: driver, commander, rangefinder operator, protractor operator, observer and 1 – 3 radio operators. Each mobile artillery battery should receive such a vehicle but only few were built and issued to homeland defence units. 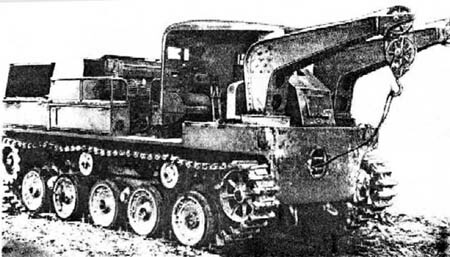 Special construction vehicle based on the Type 1 Medium Tank Chi-He. The basic vehicle was identical. The turret was replaced and the upper superstructure heightened. A large triangular cutting wedge was mounted on the bow. Main purpose was to cut paths through dense woods under enemy fire. 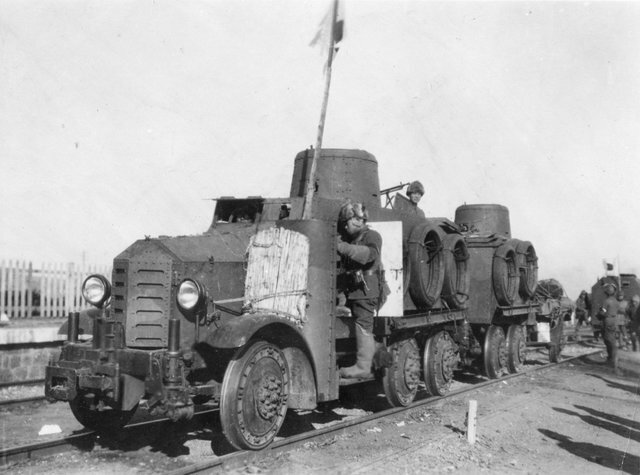 The first production vehicles were issued to 12th Independent Engineer Regiment in Manchuria but later the vehicles were sent to the other theatres as airfield and road construction vehicles. A total of 40 vehicles were built. Special construction vehicle based on an experimental prime mover. The suspension was similar to the Type 97 Chi-Ha but had only five roadwheels with the rear one mounted separate. In the bow a Diesel engine was placed. On the lightly armored engine compartment two small cranes were mounted to carry chopped trees. Behind the engine the driver´s compartment was placed. The rear half of the vehicle consisted of a storage compartment for tree chopping and removing equipment including a powered chainsaw. Total production number is unknown. The Vehicle should work as team with the Armored Lumberjack Ho-K. The following engineer vehicles are less known and most data is lost. 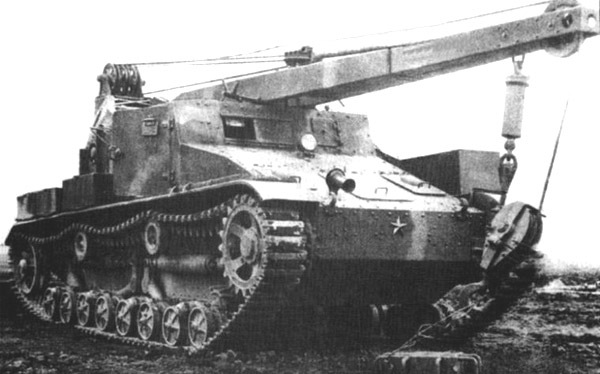 A Type 97 Chi-Ha was tested with a retractable massive crane structure mounted on the front of a modified turret. On the forward end of the crane a small charge was placed. Then the crane was extended several meters to place the charge directly inside a bunker through an embrasure. The crane was retracted and the charge exploded destroying the interior. The whole concept only works with larger embrasures like for a gun etc. But this would have exposed the tank to counter fire. The vehicle was not introduced. 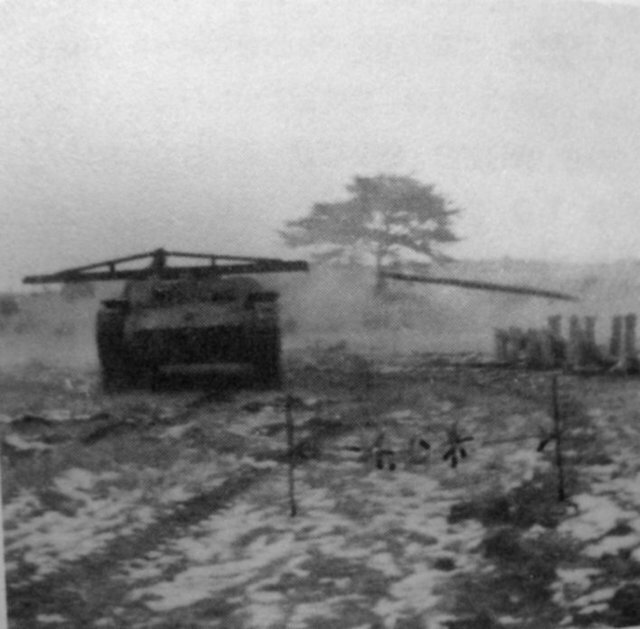 Another trial was to use a Type 97 Chi-Ha as special wire obstacle clearing tank. The turret was replaced by a long turnable firing device for four long Bangalore torpedoes. The vehicle drove near the obstacle and fired a charge at it using a spring mechanism on the rear end of the firing device. Again the vehicle was exposed to covering fire as the range was limited. It was not introduced. 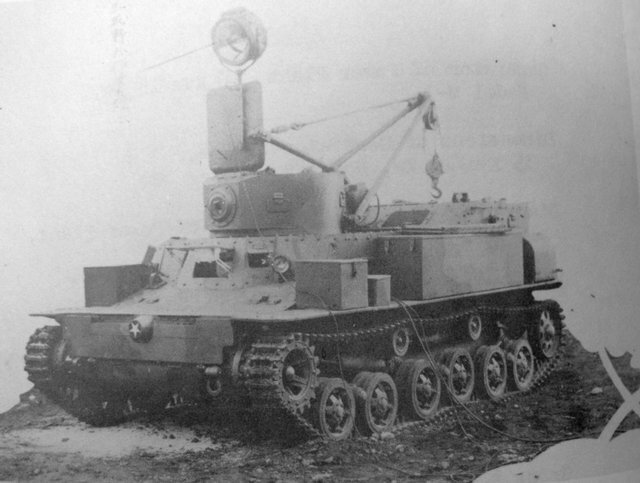 A Type 97 Chi-Ha was equipped with an experimental mine clearing device designated Chi-Yu consisting of two flail drums, three girders and a bow mounted lifting device operated hydraulically. The drums where placed in front of the tracks and rotated driven by the driving wheels exploding the mines below it. Another special purpose vehicle based on the Type 97 Chi-Ha. Development started in 1943. Main turret armament and antenna were removed. It is not sure if the gun or the MG, but one of them was replaced by a spigot type launcher for a small explosive charge against obstacles. On the rear armor a rocket thrower with eight rocket launchers in two rows was mounted angled. Small boxes with explosive ropes were placed below the wire made launching tubes. After firing a rocket the attached rope fell over the minefield and detonated exploding all mines next to it. There are reports of two prototypes tested. 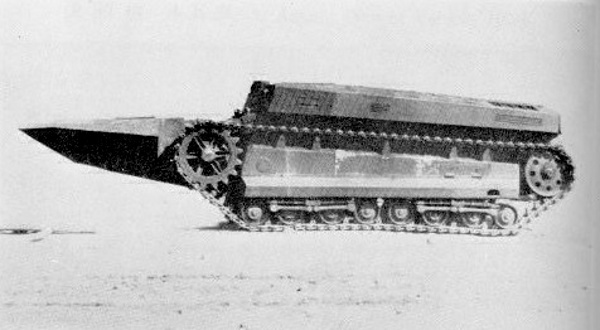 Experimental vehicle based on the Type 97 Chi-Ha. The tank was heavily modified. The last road wheel was removed and the idle wheel lowered to the ground to increase track ground contact. The superstructure was replaced by a shorter fighting compartment without bow MG or driver´s extension. A small conical turret with a standard MG mount was placed offset to the left on the new superstructure. Due to a smaller engine the engine compartment was smaller. On the rear a massive construction for a trench plough was added to cope with the forces while trench digging. Special purpose vehicle based on the Type 1 Chi-He. The turret was removed. Instead a bridge laying device for a 1850 kg 9 m bridge was added on the vehicle. The bridge was layed using a fast pulling mechanism based on an aircraft catapult used on Navy ships. The mechanism was powered by combustion gases of gunpowder charges. With it the bridge could be thrown 10 m. To increase this range to 11,4 m small rockets could be added to the front of the bridge. A winch powered by the engine was used to reload the bridge after usage. This took 5 minutes. Some more vehicles with almost all data lost. This vehicle was a side development of the Experimental Lumberjack No. 1.Purpose was to move away the trees cut down by the lumberjack. It used a similar suspension but with slight differences. On the bow two small cranes able to lift medium loads were placed. The driver sat behind the cranes. The engine was mounted in the rear. The concept was later taken over for the Lumber Sweeper Basso Ki. Specially designed tank for airborne units. With the delay of the Ku-7 gliders a proposal was made to develop a tank able to fly as glider. The resulting vehicle was small with an aerodynamic bow, a small driver´s cupola a small turret in the center and an engine compartment in the rear. It should be armed with a 3,7 mm gun, a flamethrower or a MG. A detachable empennage could be mounted behind the turret and detachable wings on the sides of the vehicle. The whole construction should be able to be towed with a Ki-57 transport plane. Only a wooden mockup was built in 1943. 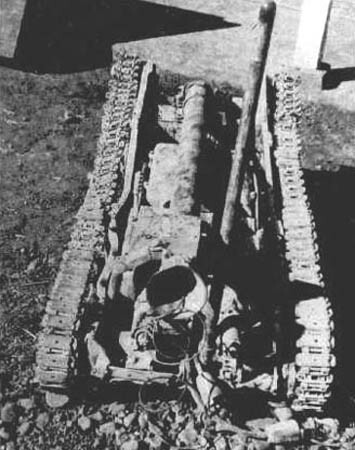 In late 1943 the decision was made to mount the at this time experimental 105 mm Tank Gun in a fixed fighting compartment on the chassis of a Type 5 Tank Chi-Ri. There are two different versions discussed in the web, one with the fighting compartment in the center, the other with it in the rear. Both have the bow armor of the Chi-Ri. 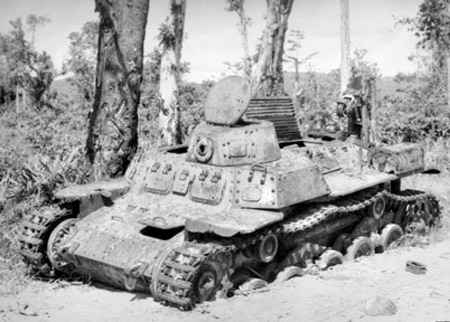 But the only existing contemporary picture of a wooden mockup shows a vehicle similar to the german Ferdinand with the fighting compartment in the rear and a sloped frontal armor instead of the stepped of the Chi-Ri. This way the vehicle could withstand hits of US 76 mm tank guns without needing a more massive armor. There are no infos about the later development stages so the web discussion is more or less based on fictional facts. 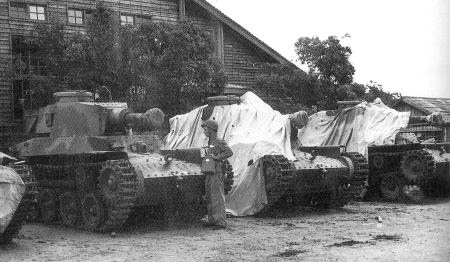 There was at least one prototype under construction before surrender. Special construction duty version of the Type 4 Generator Vehicle. The vehicle was largely remodeled to add a dozer blade. It still had a generator for powered tools. Serial production was planned but did not start. IJA developed a small number of special afv for infantry use. These were mainly used to transport men and supply. 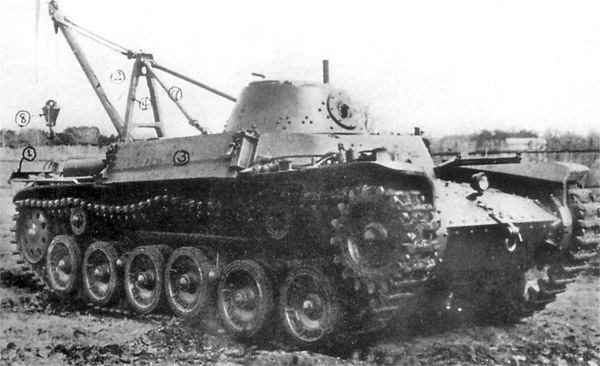 With the introduction of the Type 97 Tankette Te-Ke a special version for armored ammunition transport was developed. The engine was moved to the right of the driver. The fighting and engine compartments were replaced by an open top cargo bay. It was possible to transport up to 1 t of cargo or 4-6 soldiers. The tank could be loaded and unloaded through a large vertical two hatch door on the rear. 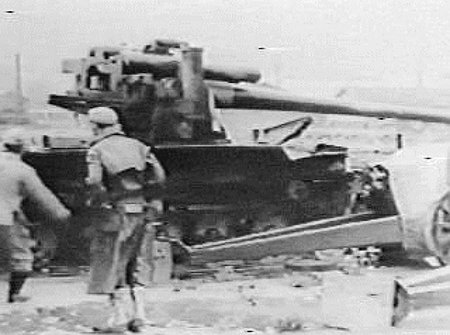 A towing bar was mounted for lighter weapons up to the Type 1 47 mm Rapid-fire Gun. 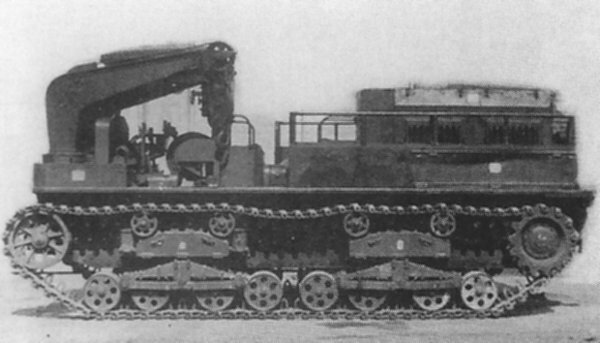 In the late 1930th the development of full tracked transport vehicles started. After several trials with different suspensions Hino Motors developed a version with a semi-Christie suspension consisting of four large road wheels, a rear driving wheel, a forward idle wheel and two return rollers. Driver and engine were placed in the bow. On the rear a large open top transport compartment for up to 14 men was mounted. Access was possible by a large two door hatch on the rear. There was also a towing bar but with a trailer or gun towed it was a problem to unload the soldiers quick. The 6 mm armor was vertical with a slightly sloped bow armor. It was possible to mount a standard heavy MG on the driver´s compartment for defense. A 6-cylinder Diesel engine was used. Due to a low priority production did not start before early 1944. 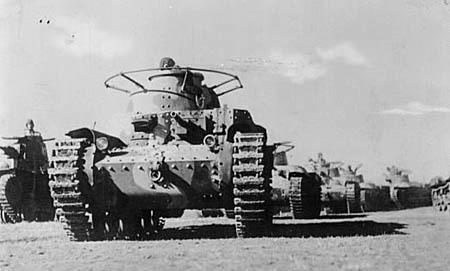 Several vehicles were sent to China and the Philippines but most of the limited serial production was issued to the 3rd Tank Division in Japan for homeland defense. 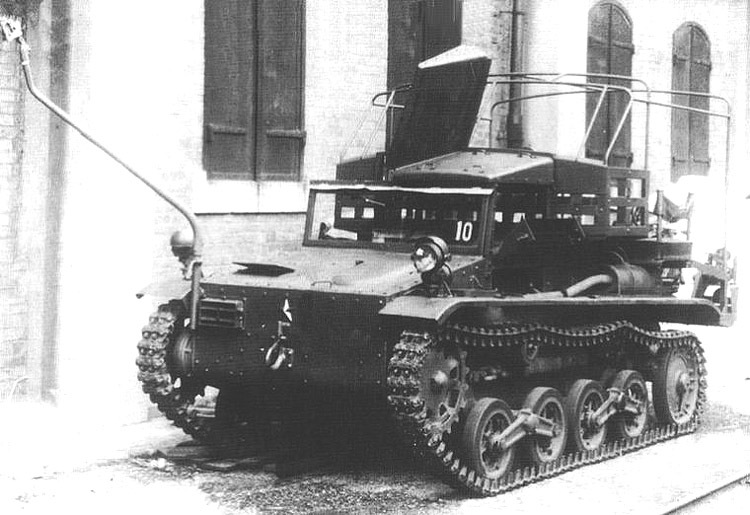 In 1941 IJA ordered Hino Motors to develop a fast half-tracked APC similar to the german SdKfz. 251. It should carry up to 12 soldiers or 2 t of cargo under armor protection against infantry small rounds at a maximum speed of 50km/h. 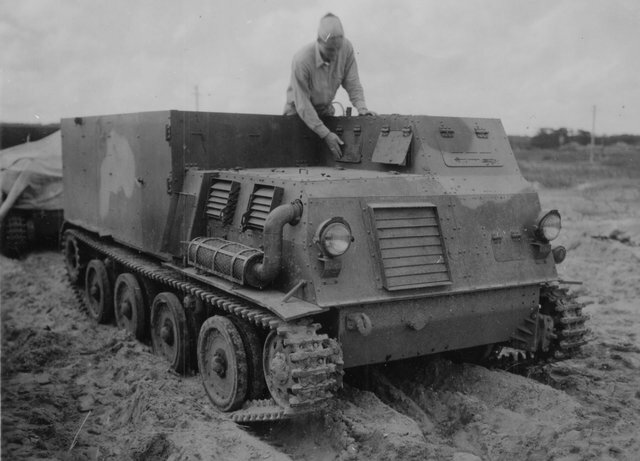 The halftrack design should be taken as it was expected that fully tracked vehicles of that size wouldn´t be able to drive at the necessary speed. The resulting vehicle had similarities with the SdKfz 251 but was a different design. The front axle wasn´t powered and should only be used to steer on harder ground. The rear suspension consisted of two pairs of large road wheels, a forward driving wheel, a rear idle wheel and a single return roller between the center road wheels. Both sides could be used for steering separately by using the reduction gears or the breaks. A 6-cylinder Diesel engine was mounted in the bow. A crew compartment for driver and commander was mounted behind the engine. The rear 2/3 of the vehicle were a large storage room. The 6 mm armor was arranged sloped to the front and the sides with the lower bow and side armor negatively and the upper armor positively angled. The rear armor was vertical. A large two-door hatch opening to the sides allowed access to the storage compartment. The whole rear structure was open top but could be covered by a canvas. For close defense three LMG could be mounted on each side behind the crew compartment and on the rear. Production did not start before 1944 with ca. 300 vehicles built. Most production vehicles were issued to homeland defense units. Only a few were sent to China and the Philippines with fewer reaching their targets due to the large air and sea superiority of the Allies. After the war some of the surviving vehicles were used for civil purposes but most were destroyed. Amphibious wheeled vehicle with a lightly armored fighting compartment developed by Toyota. 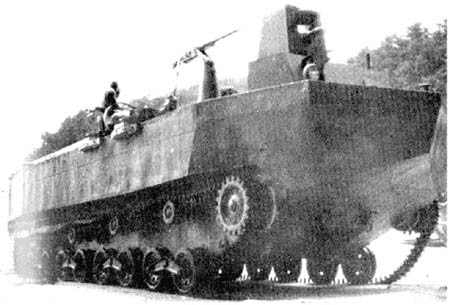 It was based on the Amphibious Truck Su-Ki. The boat-shaped hull made it possible to use the vehicle even in rougher sea. Details are unknown. That´s the actual state of my research on this topic. Feel free to ask or to correct things I got wrong. The Imperial Japanese Navy used AFV since the First Shanghai Incident in 1932. First vehicles were domestic and foreign armoured cars like the Type Crossley Armoured Car or the Osaka Armoured Car. The first tank unit was raised in 1936 as part of the Tokubetsu Rikusentai = Special Naval Landing Forces (japanese Marines). It was equipped with standard Type 89 Medium Tanks. Later navy tank units were based on various pacific islands equipped with Type 95 Light Tanks, Type 97 Medium Tanks and Type 97 Medium Tanks KAI. IJN tanks used an anchor instead of a small yellow star as national emblem. Several units also painted the Rising Sun Flag (the navy war flag) on their tanks. IJA units only used the Hinomaru Flag (the army war flag) on captured tanks to mark them as own vehicles. After 1940 IJN developed several special tank and armoured vehicle types which are covered here. The first tests with the incomplete prototype started in late 1941 at Lake Hamada, Shizuoka Prefecture. The vehicle was finished until early 1942. It consisted of the tank, two large detachable pontoons, a detachable conning tower and a detachable special air intake extension. All hatches openings and holes were made watertight by rubber seals or bulletproof glass. Crew consisted of driver, bow gunner, commander, gunner, ammunition supplier and mechanic. As IJN was not allowed to operate tanks the vehicle received the designation "Special Motor Launch" instead. The vehicle was very different from the Type 95 Light Tank. Suspension and power transmission were similar but most parts were newly developed to cope with the weight. The rear idle wheel was relocated to the ground to increase ground contact. The springs and bell cranks were all mounted inside the vehicle to protect them from corrosion by sea water. The armor scheme was completely different. Bow and rear armor were optimised for easy removal of the pontoons. All armor plates were flat and welded together. The lower bow armor consisted of two flat 12 mm armor plates with different negative angles. 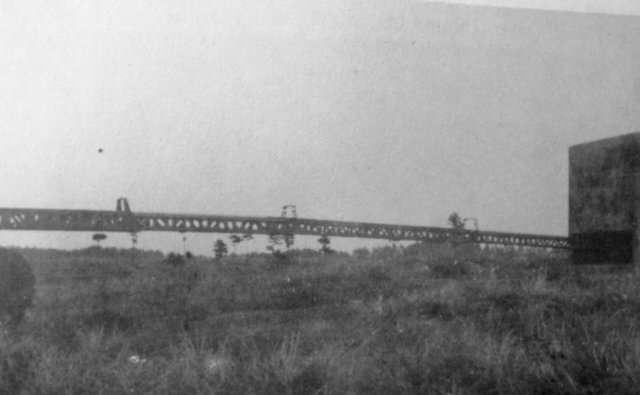 The upper part covered the tracks. 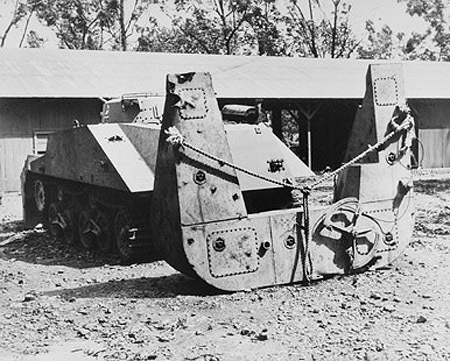 Two clamps were mounted in the upper armor plate to fix the forward pontoon afloat. The upper bow armor was arranged sloped with both sides bent to the rear. A visor port for the driver was mounted on the (in driving direction) right side. In the center a third clamp for fixation of the pontoon was placed. On the left a standard MG mount was riveted to the armor plate. With the MG removed a detachable hemispherical cap covered the MG port watertight. Just before going ashore the cap was dropped off and the MG was mounted. The side armor was arranged vertical. Flotation chambers were placed above the tracks on each side which also gives additional protection by the spaced armor effect. There was no access hatch for driver and bow gunner. On each side a ventilation air intake for the fighting compartment was mounted on the top armor next to the rear part of the turret. Both were covered with a hatch. Above the driver the steering cable for the rudders is starting. Several guide pulleys leads the cable to the rear along the right upper edge of the fighting compartment. The turret was a modified version of the turret from the Type 98 Light Tank. It was slightly conical with a large hole for optical equipment on each side of the gun mount. A large semicircular hatch on the turret with a two-part lid allowed access. Armament consisted of a Type 98 37 mm Tank Gun and a coaxial Type 97 7,7 mm Tank MG mounted slightly offset to the left. A semicircular handrail was welded on the rear turret to make entering the tank afloat easier. A removable steering mechanism for the propellers and rudders was inside the turret. Afloat the commander steered the tank from there. The gunner left the turret during that phase. The top armor of the engine compartment was arranged sloped to the rear. The side armor was slightly sloped, too. The side parts next to the engine compartment were arranged sloped with a much lower angle to simplify slipping of the rear pontoon when removing it. The rear armor had a nearly vertical upper part and a negatively angled lower part. Clamps on the armor on the side of the engine compartment and on the upper rear armor fixed the rear pontoon afloat. The engine was mounted lengthwise in the rear. There was no separating steel plate between fighting compartment and engine making it quite loud inside the tank during movements. Three hatches in the rear top armor allowed access to the rear fighting compartment and the engine. The center hatch was the largest. It had a large air intake covered with a grid. The detachable air intake extension could be mounted on this grid using clamps and hooks. A rubber band on the armor plate made the connection watertight. The mesh-covered muffler was placed on the right side, the tail pipe was raised. The ammunition supplier and the mechanic had their seats between turret and engine. The ammunition supplier had to help the commander by giving him the ammunition loaded inside the vehicle. He also moved MG ammunition from the transport racks to the bow gunner and gunner. The mechanic had to watch and maintain the complex machinery especially during operations afloat. During operations on land he was not really needed (repairs could be done faster by the maintenance units) and so not inside the tank most of the time. The forward pontoon had a u-shape and was designed streamlined for an excellent driving quality. He had three flotation chambers with a total volume of 6,2 m³. The pontoon could be lifted by a collapsible jib boom (part of the equipment) over three hooks on the upper edge and two short handling rods on the lower part. With the pontoon attached the driver´s visor port was completely covered. A small recess allowed mounting the MG. 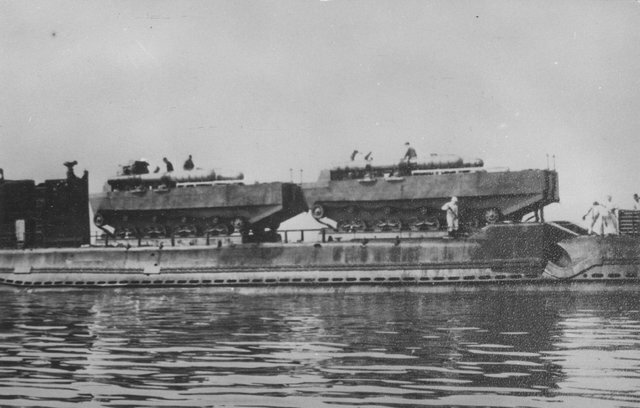 The rear pontoon was also u-shaped with the rear edges rounded. It was had three flotation chambers but only with a volume of 2,9 m³. The rudders were mounted under the pontoon on long axles which reached through the whole pontoon to the steering mechanism on top. Six hooks are mounted on the upper edge and two handling rods on the lower part for handling the pontoon with a jib boom. Afloat the tank was operated from a small detachable conning tower mounted on the turret which could be easily detached. This was necessary as the view from inside the turret was too bad for navigation on the sea. The tower was conical with three visor ports next to each other in the forward part and three more mounted in each side and the rear. On top was a small access hatch. On the ocean the commander steered the rudders from inside the tower. To prevent spray from the waves to get inside the engine a conical rectangular air intake with a wider cap could be mounted on the engine compartment. This was necessary in bad weather or heavier sea. The pontoons, the conning tower and the air intake extension were welded using 3,2 mm thick face-hardened armor plates. It was possible to transport both pontoons with a single Type 94 6X4 Truck. All parts necessary to get the tank ready for operation could be mounted by the crew within 15 minutes with the equipment of the tank. Afloat two large screws next to the tracks moved the tank. 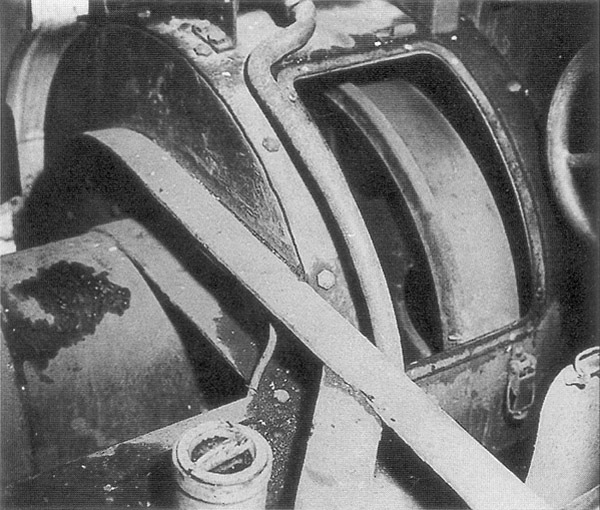 The driving shafts were connected with the engine over a power dispensing devise which separates the two types of propulsion. This device was also responsible for sending power to the bilge pumps. The rudders were mounted on the rear pontoon. The concept worked very well and so in mid 1942 the decision was made to start a serial production immediately. Official designation was "Special Type 2 Motor Launch". It seems that the popular short designation "Ka-Mi" wasn´t adopted officially but it was used by the units operating the vehicles. 300 vehicles were ordered. The first unit using this tank was formed in late 1942. 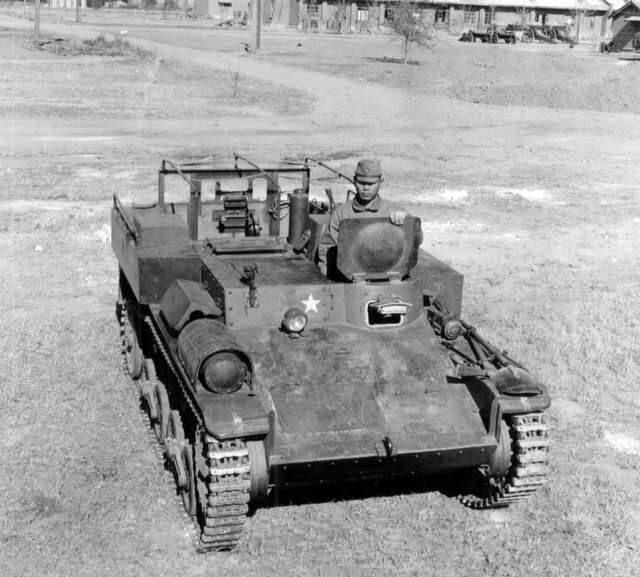 There are few US reports of early version Type 2 armed with the Type 94 37 mm Tank Gun but there was no japanese source yet. After the first exercises some changes were demanded by the soldiers. So a radio was added, the antenna base was welded on the rear right of the turret. The forward pontoon was remodeled to improve detaching. Therefore it was cut along the center line making it two-piece. The recess for the bow MG was widened to make the driver´s visor port accessible. The clamp in the upper bow armor was now surplus. A handrail was added to the pontoon. Other changes were made inside the tank to simplify handling. Most important was the installation of an onboard communication system with headphones to compensate the engine noise. The changes were adopted officially in summer 1943. Only 184 vehicles were produced by Mitsubishi until surrender due to raw material shortages and a change in IJN strategy. They were issued to independent tank companies of the SNLF. Several units fought against US invasion forces in 1944 and 1945. Most spectacular was the attack of the 101st SNLF which swam from Luzon via Samar to Leyte during the US Invasion in late 1944. Due to the weak gun the success was limited. Nevertheless the US Army and Navy was impressed by the good seaworthiness which was far superiour to any other contemporary amphibious tank in the world. It was even possible to carry the tanks with submarines and launch them shortly below the surface. In western literature the first production version is sometimes designated "Type 1 Ka-Mi" or "Type 1 Ka-Sha" which is not correct. There was no change in the official designation. There are still several Type 2 Ka-Mi rusting on different pacific islands. Only few are on display in museums. A vehicle with both pontoons and the air intake extension can be seen at Kubinka Tank Museum near Moscow. After introduction of the Type 2 Ka-Mi SNLF demanded a similar vehicle with more armour and a 47 mm gun. The development of a successor was started in early 1943. Most data were lost after surrender. So many details are unknown. Development was done in cooperation with Mitsubishi. To speed up the process many parts of the Type 1 Chi-He were used including the turret, the engine, suspension elements and parts of the transmission and steereing. Other elements were modified from the predecessor like the pontoons, steering and propulsion afloat and internal structure. But it was not developed from the Type 1 Chi-He as stated in many sources. The hull was huge and bulky. Bow, side and rear armor were almost vertical making it easy to penetrate it. Only the upper front and side armor was arranged sloped. There were four access hatches to the flotation chambers in each side armor. Two clamps each in the bow and upper bow armor fixed the frontal pontoon. Driver´s visor port and bow MG were arranged as in the Type 2 Ka-Mi. The turret was placed in the center line. 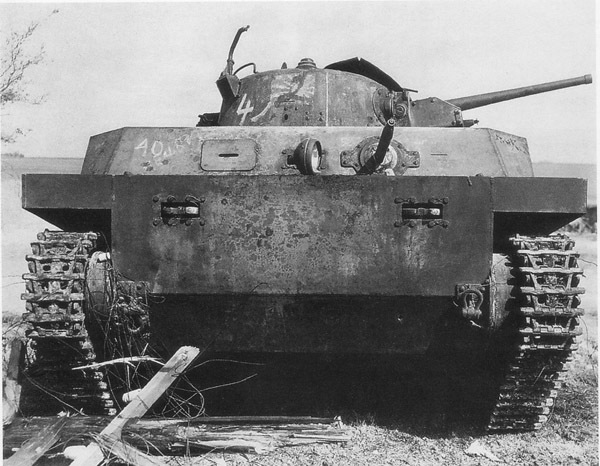 There were two pairs of ventilation hatches on the sides of the top armor, one between driver and turret and one next to the turret overhang. The cable for operating the rudders started on the right side in front of the turret. Number and location of the access hatches to the fighting and engine compartment are unknown. The air intake extention was mounted at the rear end of the engine compartment. So it can be assumed that the main engine access hatch was there, too. There was an exhaust pipe with muffler and raised tail pipe on each side of the vehicle´s rear top armor. Four clamps on the rear armor fixed the rear pontoon. The suspension consisted of four pairs of roadwheels. Two pairs each were connected with bell cranks to a large vertical coil spring covered by a semicircular armor plate. The rear idle wheel protruded the vehicle completely. The frontal driving sprocket and four return rollers completed the suspension. All parts were mounted outside the vehicle. Both pontoons were quite similar to the pontoons of the predecessor but they were larger to cope with the weight. The rear pontoon did not enclose the vehicle rear. It was completely behind the tank. A similar conning tower for the commander´s cupola and a similar air intake extension completetd the equipment for seaworthiness. Only the prototype and 19 pre-series vehicles were built in late 1944. It is unknown if the short designation "Ka-Chi" was adopted officially. The vehicles were only used for exercises. Some internet sources claim that there was a successful test launch from a submerged submarine from a depth of 100 m but I found no more reliable sources yet. There is no known survivor today. The whole vehicle was far too large for the chosen armament and the armor scheme and strength would have made it an easy to destroy target. In 1943 the US presence was increased especially in the south and central pacific. This lead to increasing losses among transport and supply shippings because of submarines and long-range aircraft. Especially forward garrisons on smaller island were sometimes cut off from supply. So the landing craft should additionally be able to be transported and launched from submarines. A prototype was finished in late 1943 at Kure Naval Yard. Operational tests were finished in March 1944. Crew consisted of driver, navigator, two gunners and a mechanic. 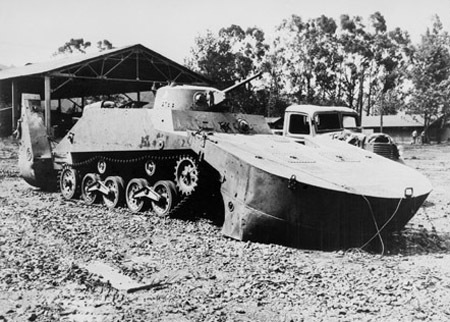 The vehicle had a boat-shaped armored hull with a maximum armor strength of 10 mm. Afloat the landing craft was powered by two propellers in the rear. Rudders were behind them for steering. For movenments on land a track suspension was added. The suspension was similar to the Type 98 Light Tank Ke-Ni. It consisted of four pairs of roadwheels connected with bogies. Each two pairs were connected by bell cranks with large horizontal coil springs. These elements were placed inside the vehicle for protection against corrosion by seawater. A forward driving sprocket, five return rollers and a rear idle wheel completed suspension. The whole vehicle was covered by an armored deck. Internal chambers on the bow and rear delivered additional buoyancy for stabilty. Crew and engine compartment was in the forward half. 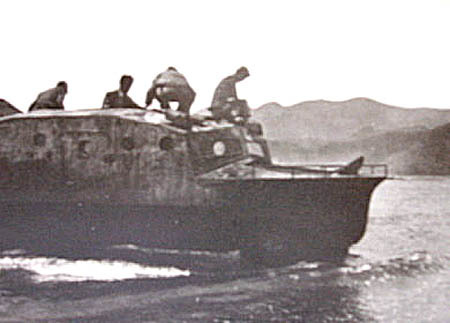 A driver and a navigator operated the landing craft from an armored cabin with two visor ports on the bow. The rudders were operated over a cable mechanism similar to the Special Type 2 Motor Launch. During the final approach to the shore the driver could change to a steering position on the deck behind the cabin. There he was protected by armor plates from the front and the sides. The rear was open for a better overview. A visor port was placed in the frontal plate. A Type 93 13,2 mm AA-Machine Cannon could be mounted on a pivot on each side of the steering position on deck. During tests the vehicle was easy to steer but slow. Nevertheless the design was accepted under the designation "Special Type 4 Motor Launch".It is unclear if the short designation "Ka-Tsu" was introduced officially. In January and February 1944 US forces captured the central pacific atolls of Eniwetok, Kwajalein and Majuro. During the following months US-Navy expanded the already built japanese air and naval bases to a a large forward base for future operations against Truk and the Marianas (Saipan, Tinian, Guam). Japanese submarines and long-range reconnaissance aircraft delivered good reports about these works. So in April 1944 IJN started to plan a massive attack on these bases (Operation Yu-Go). Part of these plans was to launch special attack units using torpedo vehicles from submarines to attack anchorages. For this operation the vehicles should be used. This made several modifications necessary. The exhaust pipes and the steering mechanism for the rudders were relocated below the deck. On each side a mount for a modified Type 91 Model 3 450 mm aircraft torpedo was welded on the deck above the fighting compartment (Many western sources claim that the torpedoes were Type 93 610 mm Long Lance but almost all japanese sources say Tpe 91 Model 3). A simple aiming device was mounted in the driver´s cabin. Special hooks to carry the vehicle with submarines were also added. To mount the torpedoes the machine cannons had to be removed. During the first trials the crew had problems to keep the vehicle watertight submerged. The air intakes finally had to be sealed with special coverages to prevent the engines from flooding but it took some 20 minutes to remove them and to make the vehicles ready to start. During this time the submarine had to stay at the surface. A submerged start as planned was not possible. Nevertheless IJN decided to introduce the vehicle with these changes. Production numbers are unknown but at least 50 vehicles were built. Operation Yu-Go was cancelled in mid 1944 due to the fast US advance to the Marianas. The operating soldiers disliked the slow speed afloat but they had to use the vehicles because there was nothing similar avaliable. 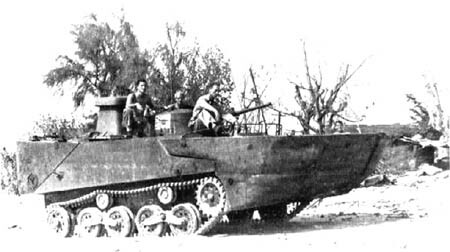 Crew training continued and until late 1944 800 soldiers were trained on these vehicles. In late 1944 operations against US ships at Luzon were planned but cancelled after a tanker destined for fuel supply was sunk during a convoy mission. Some sources claim that the unit was used in 1945 to resupply cut-off pacific island garrisons. The plans for homeland defence included suicide torpedo attacks of the Special Type 4 Motor Launches on the invasion fleets. There are only few informations about this vehicle avaliable. It is even not sure that the prototype was finished before surrender. Upon the avaliable drawings (which differ largely in details) it can be assumed that the tank was a try to remodel the Special Type 4 Motor Launch to make it less vulnerable against enemy fire. Size and shape are similar, most known data also fit for both vehicles. The most significant changes are a far better bullet deflecting armor scheme, a change in armament and different pontoons. The upper bow armor was now sloped with a lower angle. The lower part was still negatively sloped but with a shallower angle. The superstructure armor wasn´t changed on front and sides. 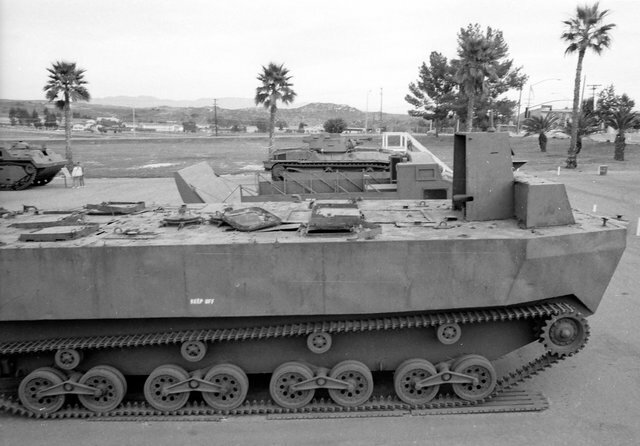 The rear armor was now similar to the Special Type 2 Motor Launch. The Type 1 47 mm Tank Gun was now mounted on the position of the bow MG. The MG was replaced to the right between gun and driver´s visor port. In the turret a modified Type 96 25 mm Machine Cannon replaced the gun. 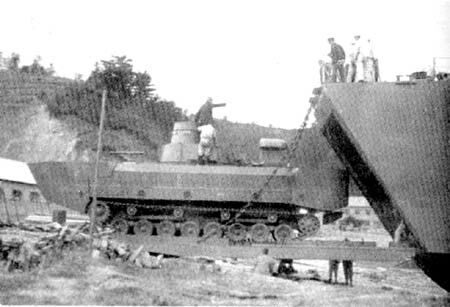 Due to an error in the book "Tanks of the World 1915-1945" from Peter Chamberlain and Chris Ellis many internet sources show a picture of the Special Type 2 Motor Launch without floating equipment as a picture of this tank. This is definitely wrong. There is no known picture of the Special Type 5 Motor Launch. 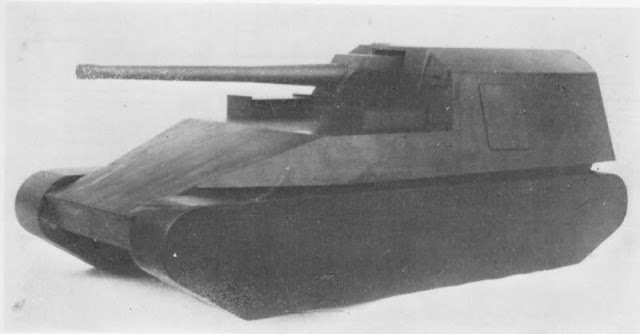 In late 1944 the SNLF demanded a gun tank similar to the IJA Type 2 Gun Tank Ho-I but with a larger gun for close support. So the decision was made to upgun the Type 97 Medium Tank KAI with the short 12 cm gun developed in 1942/43 for close defence of transport ships. The hull of the tank was not changed. The gun mount was replaced by a massive mount with a large recoil mechanism. There were several recoil cylinders mounted around the barrel and covered with a round armour for protection. This recoil mechanism was still not able to cope with the recoil forces and so a flat muzzle break had to be added, too. Maximum range was reduced due to the limited elevation of the gun mount. Due to the screw-type breech of the new gun the already low space inside the turret was reduced. In addition the ammunition was heavy. 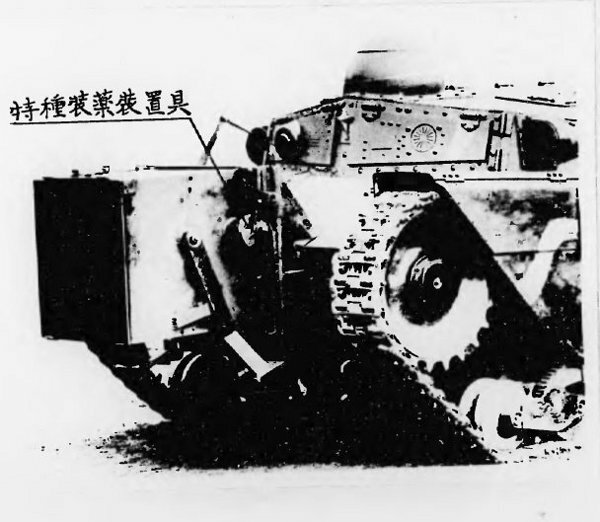 An unknown number of Chi- HA KAI were modified this way in 1945. After surrender US units found at least 4 vehicles at Sasebo SNLF base and 10 more at Yokosuka SNLF base. All were scraped postwar. Informations on this vehicle are rare. After surrender US forces found at least one vehicle at Yokosuka Naval Yard. It is unknown if it was a local conversion or an official development. A Type Taisho 10 120 mm gun was mounted on the hull of a Type 97 Medium Tank. The turret was removed and the hole closed by steel plates. Additional steel plates were welded on each side of the fighting compartment to create a platform for the gun crew. There are no further infos. Due to the gun weight and dimensions it can be assumed that the vehicle was top-heavy making it a quite unstable firing platform. Last edited by tom! ; 01-23-2018 at 12:06 PM.